Our iOS devices aren't built for efficiency. Unlike OS X, where we can simultaneously work in multiple apps and position windows and folders on our desktops for optimal output, iOS has a far greater focus on individual tasks. Even accomplishing something as simple as copying text from Safari and pasting it into a note requires a set series of steps and hoops, and any kind of real multitasking is hampered by the safeguards Apple has built into the system. Workflow can automate complicated tasks and help you work smarter and more efficiently—or you can use it at a restaurant to figure out the tip. iOS 8 has begun to alter this line of thinking. Instead of creating isolated islands, developers are now able to build bridges to nearby apps, eliminating the clunky workarounds that they were previously forced to implement. 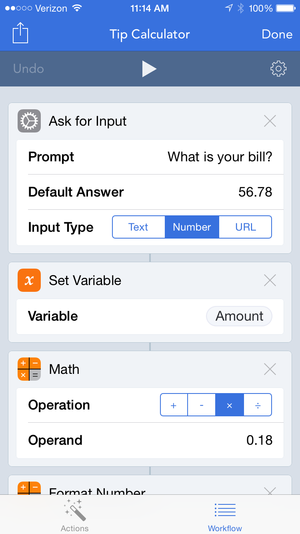 From widgets to extensions, iOS is suddenly alive with expandability and customization. And now we have an app that brings it all together. The first true automator for iOS, Workflow ($3) takes full advantage of Apple's looser restrictions on sharing to bring new levels of interactivity and multitasking to our handheld devices. More versatile than the situational IFTTT and more powerful than even Launch Center Pro's slick system of shortcuts, Workflow's endlessly customizable actions integrate seamlessly into the apps you already use to help you work smarter, faster, and just plain better. 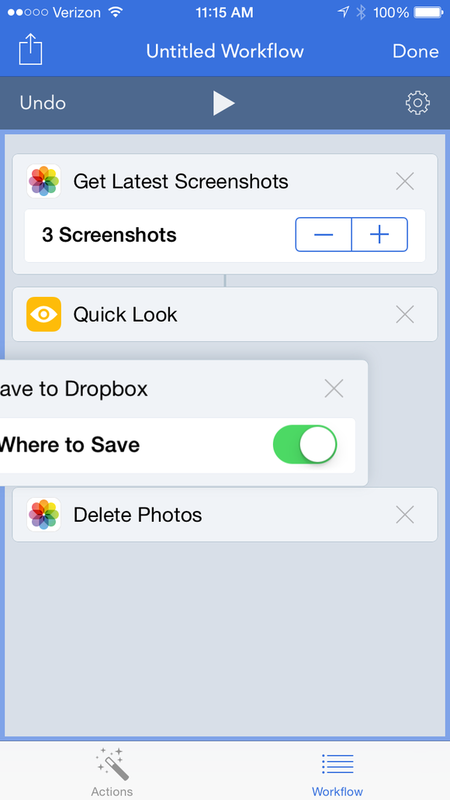 There's a delightful simplicity to Workflow's interface that belies its abilities. A quick tutorial walks you through building an automatic GIF maker, and as you set up each step, you'll notice that the app brings over another element of OS X that is foreign to the iPhone and iPad: drag and drop. It makes the creation of workflows an absolute pleasure and serves to eliminate much of the requisite knowledge needed to set up proper shortcuts. 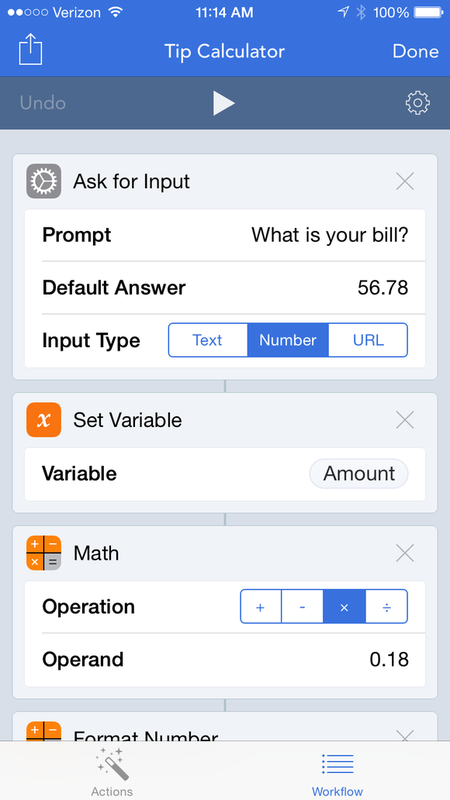 Where other automating apps rely on the user's know-how of Python scripting or URL schemes to accomplish anything beyond the most rudimentary of tasks, Workflow has created a custom iOS framework that does most of the heavy lifting behind the scenes. It's all a bit like an iOS version of Automator, and the finished products are not unlike OS X's "automation recipes." You're not seeing things—Workflow lets you drag and drop on your iPhone. Developer DeskConnect has loaded the app with more than 100 common actions that can be stacked and sorted in any number of ways. Things like Quick Look, Add New Event, and Send Email work together to create step-by-step processes designed to simplify and streamline the things we would otherwise turn to the multitasking carousel to accomplish. Each action contains a plain explanation of what it does, but you'll learn better by seeing them at work; as you mix and match actions, pressing the “run” button will show you how they work together, and the natural quickness and intuition of the interface encourages somewhat obsessive testing. There's no limit to how much a workflow can do, and you can rearrange and combine actions to accomplish a whole string of tasks; for example, you can effortlessly make a workflow that collects your last five photos, zips them, uploads them to Dropbox, and emails you a link. But Workflow's true beauty lies in its tremendous versatility. The general concept can be grasped in just a few seconds, and while it'll take a good deal of trial-and-error experimentation to master it, you don't have to be an expert to find a way to fit it into your routine. A built-in gallery helps get you started, and with an easy sharing mechanism, it won't be long until websites are dedicated to supplying many, many more. The app excels at cutting down the number of steps it would normally take to schedule an appointment or delete a handful of screenshots, but its usefulness extends beyond merely limiting your taps and swipes. In some cases, Workflow is actually able to add functionality that isn't there. I've always been frustrated by the inability of most text editors to count the number of words in a selection, so I made a simple workflow that counts words on the clipboard and added it to my home screen. With the use of variables, prompts and conditional "if" commands, its capabilities go well beyond the countless combinations, and while I did my best to put it through its paces, it seemed like I barely scratched the surface of what Workflow is capable of doing. Workflows exist where you want them to—whether that's on your home screen, as a Share Sheet icon or in the app itself—so you're never far from executing one. And even though the app technically needs to launch in each of these instances, the various options give it the quickness of a keystroke, making them seem more like true shortcuts than any of the other automation apps I've used. Notably missing is a widget that lets you run workflows via the Notification Center, but Apple's been a bit persnickety about that lately. Hopefully one will be allowed in a future update. When accessed through the iPad's Share Sheet, workflows almost make it seems like we're working in two windows at once. Almost. As a universal app, it's a bit frustrating not to be able to sync your workflows over iCloud, but each version offers unique benefits. On the iPhone 6, it helps bring back some of the one-handed operation lost with the larger screen, and on the iPad, the extra space gives some workflows a multitasking feel, such as when you use the action extension while in Safari to browse your music library. Workflow works with a decent cross-section of third-party apps like Tweetbot, Things, Uber, and Evernote, as well as tapping into iCloud Drive's file system for uploading, but I get the impression that it will be evolving rather quickly. But even if it never sees another update, Workflow doesn't disappoint. Without needing to circumvent Apple's rules, it's able to lift our iPhones and iPads to new levels of efficiency and brings us ever closer to the post-PC promise of mobile independence. 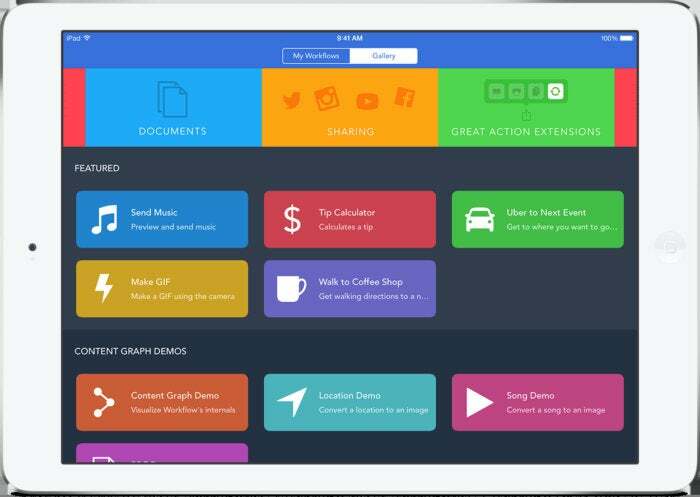 With a style and simplicity all its own, Workflow brings desktop-level automation to the iPhone and iPad.